The India Steel group has been producing bright bars since 1957. Through continuous process-improvements and product-development, and a commitment to customer satisfaction, India Steel is well on its way to becoming a leading global player in stainless steel long products. 1987: Emphas is shifted from carbon steels to stainless steels. 1990: Isibars Pvt Ltd (ISI standing for India Steel Industries) is floated and sets up in Turbhe, Navi Mumbai for the manufacture of stainless steel bright bars. 1992: Isibars lists on the Bombay Stock Exchange with an initial public offer, which is heavily oversubscribed. 1998: A state-of-the-art bar and rod rolling mill is bought from Pomini S.p.A. (now Siemens VA) of Italy & commissioned successfully. 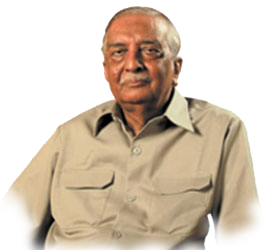 2009: The founder and Chairman of the company, Mr Harbanslal Gupta, passes away. Ashwin Gupta is appointed Executive Chairman and Sudhir Gupta as Managing Director, carrying forward the founding vision of a company committed to excellence. 2012: New furnaces and combined drawing machines are added to increase finishing capacity & improve quality. 2012: Steel-melting capacity is increased to achieve full potential of Hot-rolling facilities. 2012-13: Bright Bar capacity in Navi Mumbai shifted and merged into the Khopoli facilities.